The flat country between the Volsci (or Lepini) Mountains and the sea is actually an inclined surface where the coastal dunes are at a higher level than the ground at the foot of the mountains, thus causing the stagnation of several small rivers. In 312 BC the Romans dug a canal to protect Via Appia from being periodically inundated, but most of the plain remained an unhealthy marsh. Things got worse after the fall of the Roman empire and in the VIIIth century Via Appia was no longer practicable and it was replaced by a winding road which followed the ridge of the hills overlooking the plain and favoured the development of Sermoneta and other medieval towns. The marsh however was no protection against the raids of the Saracens, who took advantage of the coast being unpopulated. Between 700 and the year 1000 they could actually temporarily occupy the shores between S. Felice Circeo and Nettuno and from there move inland. This explains the fortified aspect of Sermoneta and the existence of watch towers built on high rocks. The walls of Sermoneta were reinforced in the XVIth century when the risk of attacks from the sea increased again: the Ottomans had expanded their empire to the coasts of Tunisia and Algeria and from there they promoted corsair raids on the coasts of Italy. The walls were also necessary due to the fact that Italy was a battlefield for French and Spanish troops and their local supporters. Sermoneta is located on the top of an isolated hill not far from Norma. 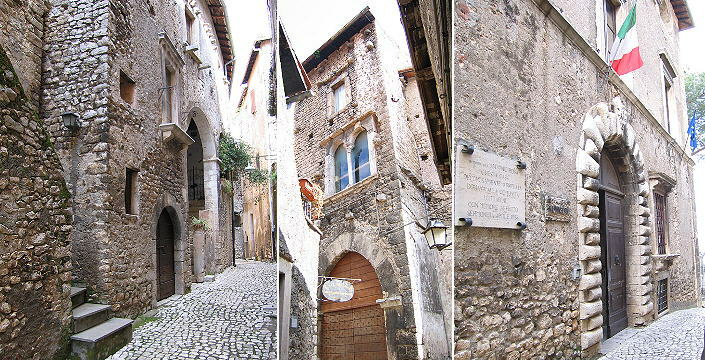 In the early XIVth century Sermoneta became a fief of the Caetani, the family of Pope Boniface VIII, who from their base in Anagni expanded their possessions towards Rome and the sea. Their castle was confiscated by Pope Alexander VI Borgia who improved its fortifications; shortly after the death of the pope in 1503 it returned to the Caetani to whom it still belongs. The castle shows details of different periods but its prevailing aspect is due to Antonio da Sangallo the Elder, who had designed for Pope Alexander VI the impressive fortress of Civita Castellana. Sermoneta, because of its position along one of the two roads which for centuries linked Rome with Naples (the other one being through Palestrina and Anagni), provided services to merchants and travellers. In particular at the beginning of the XVIth century its Jewish population expanded because of the arrival of many Jews from the Kingdom of Naples. In 1492 King Ferdinand of Aragon and Queen Isabel of Castile decreed the expulsion of all Jews from their possessions which included Sicily. Many of them moved to the Kingdom of Naples, which, although ruled by a dynasty of Aragon origin, welcomed their arrival. In 1503 however it became a direct possession of the Crown of Spain and the Jews were on the move again: several families settled in the towns of southern Latium increasing the local communities. It was not the end of their journey: in 1555 Pope Paul IV ordered the Jews to live either in Rome or Ancona in a segregated area (the Ghetto). There the Jews, who had not a tradition of using surnames, but rather patronymics, had to live in a relatively large community and for practical reasons adopted as a surname the town they came from one of which was Sermoneta. The Cathedral of Sermoneta is a sort of summary of the history of the town: built on an ancient Roman temple, it shows elements of all styles. With the reclamation of the marsh in the 1920s and the opening of a new railway which runs at the foot of the hill next to the restored Via Appia, Sermoneta lost its role and its population decreased, attracted by the new towns built on the plain: several old houses were abandoned. Today it gives the impression of a partial recovery: its old churches and the memories of the past foster the feeling of belonging to a community which the new towns seem unable to create. The 13th-century Caetani Castle was built by the Annibaldi family, to whom the papacy had granted the hill towns of Sermoneta, Bassiano and S. Donato along with other nearby estates. This imposing fortress, with its 42-metre high keep known as the Maschio, and a lesser tower known as the Maschietto, became the heart of the medieval town of Sermoneta. The Church of S. Pietro in Corte was built in the courtyard, together with a vast rainwater cistern to compensate, at such a height, for lack of alternative water sources. In 1297, during a period of economic hardship for the Annibaldi, the Caetani Pope, Boniface VIII acquired all their lands for 140,000 gold florins. He also bought Ninfa for 200,000 florins, a strategic move allowing his administration to control the important Via Pedemontana connecting Rome to Naples. From this point on, the Caetani family governed these properties for more than 700 years. During the 14th and 15th centuries, thanks to the Caetani, the Castle reached a peak of prosperity. Enlarged and re-fortified it was put to cultural uses. The Camere Pinte(painted rooms) are decorated with frescoes representing mythological figures. They date back to this period. The unknown artist is probably of the school of Pinturicchio. In 1499 the Borgia Pope Alexander VI issued a Bull excommunicating the Caetani, and in so doing confiscated their properties and turned the Castle into a military fortress, adding to the fortifications but destroying the church and so much of what the Caetani had accomplished in their time. After the death of Alexander, just five years later, the Caetani were given back their properties by Pope Giulio II Della Rovere. In the 17th century, because the properties no longer had strategic relevance, the family moved to Rome and Cisterna, and the Castle was left abandoned only to be looted by French and Spanish solders in the 18th century. Eventually, because of its poor condition, it was rented out by the family for use as a depot and warehouse. Only at the end of the 19th century did Caetani family members, aware of the historical and artistic significance of the castle, begin once more to restore and transform it into a social and educational centre. Today, the Roffredo Caetani Foundation owns the Castle, and is responsible for its conservation and for continuing the work of the Caetani family over previous centuries. The Castle is open every day, except for Thursdays, no booking required from guided tours. All visits are conducted in groups accompanied by a guide. The tour, which is not suitable for persons with walking difficulties, follows a single route and lasts approximately one hour. It is feasible to visit both the Castle and the Garden of Ninfa on the same day, allocating a half-day to each. 2 p.m. / 3 p.m. / 4 p.m.
3 p.m. / 4 p.m. / 5 p.m. / 6 p.m.
During April and May, on Mondays and Wednesdays, both the garden of Ninfa and the Caetani Caetani are open for schools. The Caetani Castle will be open as follows: 10-12 and 14-16. The 'Fossanova Abbey, built at the dawn of the' Order of the Benedictines,expanded during the eleventh and twelfth centuries in the past to the Cistercian monks, who developed the reclamation of the nearby swampy allowing the spiritual rebirth, social and economic. The church was built in the second half of 1100 with the help of FrederickBarbarossa "Fridericus Emperor Augustus always hoc opus fecit proud." In the abbey, where he met his death St. Thomas Aquinas, a Studium Artiumdeveloped for the training of monks, many of whom brought with the secrets of the influence of Fossanova sites in the surrounding area. Even before the settlement of the Cistercian monks, the place was inhabited byBenedictine monks who had built a monastery with the title St. Stephen the First Martyr, where he also lived Gregory IV dell'827 first year of his election to thepapacy. Later, probably around the year one thousand, the monastery was therestructuring and expansion, of which still remain well preserved, the three sides of the Romanesque cloister. The apartments can accomodate families or working groups from 2 to 6 persons from medium to long periods for a comfortable and relaxing stay. The Residence, despite being in the old town of Sermoneta, is easily accessible by car (you can park in front of the apartment in Via G. Matteotti 3) and it is near Restaurants, bar, supermarket and anything you need for a long time stay. - Kitchen and its forniture: washing machine, dishwasher, refrigerator, oven, stove, coffe machine with capsules. Our rooms are all equipped with private bathroom and can accomodate up to 3 guests each. Ideal for a short stay to discover the beauties of Sermoneta, Ninfa Gardens, the Caetani's Castle. During their stay, in addition to the bright and spacious rooms, our guests have access to the living area of the Residence with sofas, table and TV and can enjoy the panoramic view of the equipped terrace.